James writes that God gives wisdom to all, “liberally and without reproach”—all we have to do is ask in faith. 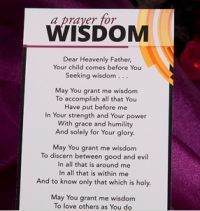 Start your day seeking the wisdom of God with this free A Prayer for Wisdom bookmark. This prayer will help focus and guide you on your search for heavenly wisdom. Keep the bookmark in your Bible, tape it to your bathroom mirror, or place it in your car, or somewhere it can be a constant reminder to you. Pray and ask that God grant you His wisdom ... that you might find His strength, His discernment, His love, His gratitude—His wisdom. It’s time to develop a true heart of wisdom after our Savior. Cick below to go to the website to request yours.